Our kitchen pantry was quite the mess, and really not useful the way the stuff was stacked in there. While, we had big plans to build in shelves, it became obvious that it wasn't going to happen in the near future. We still don't own a table saw and the other tools we'll need to cut the wood down to fit. So, instead we decided to figure out a temporary solution. We bought this commercial-grade shelf unit from Home Depot for around $90. This space is infinitely more useful now. 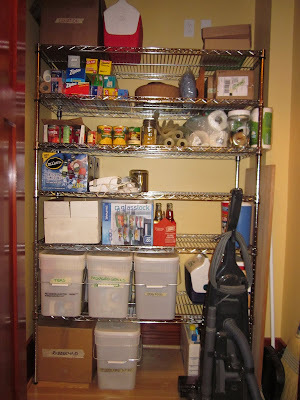 Once we build in the pantry shelves, we'll go ahead and move this shelf unit down into the basement storage area. Looks like you're all stocked up on Mikes, one of my favorite drinks!